Good afternoon honored members of VFW Post #3663 & Frank B. Bartlett American Legion Post #7, distinguished guests, ladies & gentlemen. 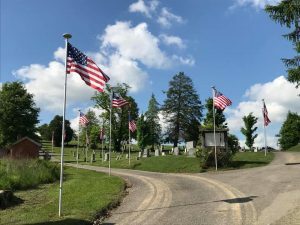 I’m David McCauley, Mayor of Buckhannon, & I welcome you all to your Veterans’ Chapel & our Heavener Cemetery on Memorial Day 2018. Today on this glorious day, our community honors all of our veterans of military service being particularly mindful of those who paid the supreme sacrifice for our freedom & liberty while we further dedicate Flagpole Hill amid this pristine & peaceful place. It has been my distinct honor to address you on previous Veterans’ Days, Memorial Days, Flag Days, & other celebrations of your military service during my 35 years of residing here in our beloved town. I’ve shared my pride for my dad who’ll turn 98 on June 10 who served in the U.S. Army in the Philippines & as part of the force occupying Japan with General MacArthur. Our Buckhannon-Upshur community regularly celebrates & honors our wonderful veterans in a number of ways. In addition to our Flags for the Fallen program here, our City honors our veterans with the Walk of Valor during Memorial Day through the Fourth of July, & again during Veterans’ Day. If you haven’t been to our Jawbone Park to see the hundreds of Veterans’ banners displayed, please do so, it’s an amazing sight. Our Veterans’ chapel here displays by branch of service those who’ve protected us. Our Veterans’ affairs committee chaired by Mary Albaugh also has been very active in touting the heroism of our veterans in our schools & throughout our community. As I’ve said on many occasions, our children must be made aware of the service of those that came before them to fully appreciate our freedom & liberties- to know that all that we enjoy in this great nation has been made possible by our having been protected by our veterans of military service. The high quality of life that we enjoy in the United States didn’t just happen- rather it has been fought for, & vigilantly protected for nearly 242 years now. During my more than two years now as mayor, we’ve recognized a wide variety of people who’ve contributed to Buckhannon’s charm, notoriety, & history. For every celebrity like Ted Cassidy (Lurch), Gray Barker (the famous UFO author), & Pare Lorentz (FDR’s documentarian)- we have honored more local individuals who have distinguished our community. 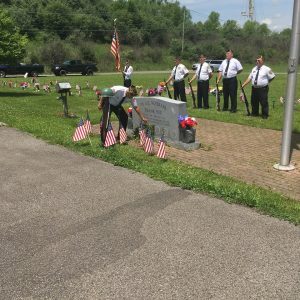 Persons like Ace Mumford, Charles Warfield, fire chief Bud Bennett, Harley Brown, Ross Straight, & police officer hero Webb Grubb have been remembered. Today, on what we might think of as Hero & History Day- we honor another one of our own- & I respectfully request that VFW Post 3663 Commander, Larry Brown join me for a couple of minutes. ON APRIL 27, 1942, UNTO HIS MOTHER, NELA (1916-91) & HIS FATHER, FLEMING (1911-64) BROWN, WAS BORN & REARED IN UPSHUR COUNTY, A TRUE AMERICAN HERO, LARRY BROWN. MR. BROWN ATTENDED BUCKHANNON-UPSHUR HIGH SCHOOL, & ENLISTED IN THE U.S. MARINE CORPS AT AGE 17 WHERE HE WOULD PROUDLY SERVE FROM 1960 UNTIL 1981. 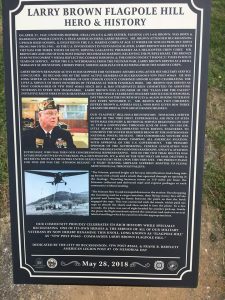 AS THE U.S. INVOLVEMENT IN VIETNAM ESCALATED, LARRY BROWN WAS DISPATCHED TO VIETNAM FOR THREE TOURS OF DUTY, SERVING GALLANTLY, PRIMARILY AS A HELICOPTER CREW CHIEF. 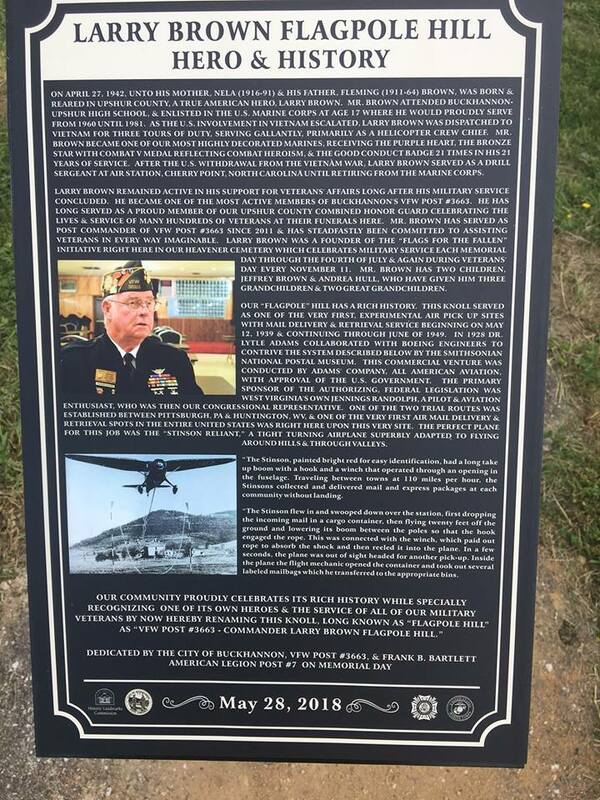 MR. BROWN BECAME ONE OF OUR MOST HIGHLY DECORATED MARINES, RECEIVING THE PURPLE HEART, THE BRONZE STAR WITH COMBAT V MEDAL REFLECTING COMBAT HEROISM, & THE GOOD CONDUCT BADGE 21 TIMES IN HIS 21 YEARS OF SERVICE. 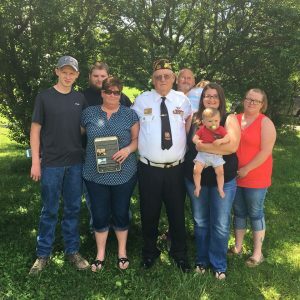 AFTER THE U.S. WITHDRAWAL FROM THE VIETNAM WAR, LARRY BROWN SERVED AS A DRILL SERGEANT AT AIR STATION, CHERRY POINT, NORTH CAROLINA UNTIL RETIRING FROM THE MARINE CORPS. LARRY BROWN REMAINED ACTIVE IN HIS SUPPORT FOR VETERANS’ AFFAIRS LONG AFTER HIS MILITARY SERVICE CONCLUDED. HE BECAME ONE OF THE MOST ACTIVE MEMBERS OF BUCKHANNON’S VFW POST #3663. HE HAS LONG SERVED AS A PROUD MEMBER OF OUR UPSHUR COUNTY COMBINED HONOR GUARD CELEBRATING THE LIVES & SERVICE OF MANY HUNDREDS OF VETERANS AT THEIR FUNERALS HERE. MR. BROWN HAS SERVED AS POST COMMANDER OF VFW POST #3663 SINCE 2011 & HAS STEADFASTLY BEEN COMMITTED TO ASSISTING VETERANS IN EVERY WAY IMAGINABLE. LARRY BROWN WAS A FOUNDER OF THE “FLAGS FOR THE FALLEN” INITIATIVE RIGHT HERE IN OUR HEAVENER CEMETERY WHICH CELEBRATES MILITARY SERVICE EACH MEMORIAL DAY THROUGH THE FOURTH OF JULY & AGAIN DURING VETERANS’ DAY EVERY NOVEMBER 11. MR. BROWN HAS TWO CHILDREN, JEFFREY BROWN & ANDREA HULL, WHO HAVE GIVEN HIM THREE GRANDCHILDREN & TWO GREAT GRANDCHILDREN. OUR “FLAGPOLE” HILL HAS A RICH HISTORY. THIS KNOLL SERVED AS ONE OF THE VERY FIRST, EXPERIMENTAL AIR PICK UP SITES WITH MAIL DELIVERY & RETRIEVAL SERVICE BEGINNING ON MAY 12, 1939 & CONTINUING THROUGH JUNE OF 1949. IN 1928 DR. LYTLE ADAMS COLLABORATED WITH BOEING ENGINEERS TO CONTRIVE THE SYSTEM DESCRIBED BELOW BY THE SMITHSONIAN NATIONAL POSTAL MUSEUM. THIS COMMERCIAL VENTURE WAS CONDUCTED BY ADAMS’ COMPANY, ALL AMERICAN AVIATION, WITH APPROVAL OF THE U.S. GOVERNMENT. THE PRIMARY SPONSOR OF THE AUTHORIZING, FEDERAL LEGISLATION WAS WEST VIRGINIA’S OWN JENNINGS RANDOLPH, A PILOT & AVIATION ENTHUSIAST, WHO WAS THEN OUR CONGRESSIONAL REPRESENTATIVE. ONE OF THE TWO TRIAL ROUTES WAS ESTABLISHED BETWEEN PITTSBURGH, PA & HUNTINGTON, WV, & ONE OF THE VERY FIRST AIR MAIL DELIVERY & RETRIEVAL SPOTS IN THE ENTIRE UNITED STATES WAS RIGHT HERE UPON THIS VERY SITE. THE PERFECT PLANE FOR THIS JOB WAS THE “STINSON RELIANT,” A TIGHT TURNING AIRPLANE SUPERBLY ADAPTED TO FLYING AROUND HILLS & THROUGH VALLEYS. “The Stinson, painted bright red for easy identification, had a long take up boom with a hook and a winch that operated through an opening in the fuselage. Traveling between towns at 110 miles per hour, the Stinsons collected and delivered mail and express packages at each community without landing. “The Stinson flew in and swooped down over the station, first dropping the incoming mail in a cargo container, then flying twenty feet off the ground and lowering its boom between the poles so that the hook engaged the rope. This was connected with the winch, which paid out rope to absorb the shock and then reeled it into the plane. In a few seconds, the plane was out of sight headed for another pick-up. Inside the plane the flight mechanic opened the container and took out several labeled mailbags which he transferred to the appropriate bins. Thank you, Commander Brown, for your excellent service to your country & for us all. Today, we thank all of our B-U veterans- our brave, our heroes. Enjoy… YOUR day.